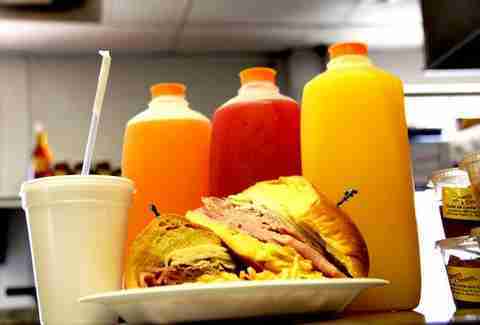 If there's one thing people from Miami love, it's... well, these 29 things. 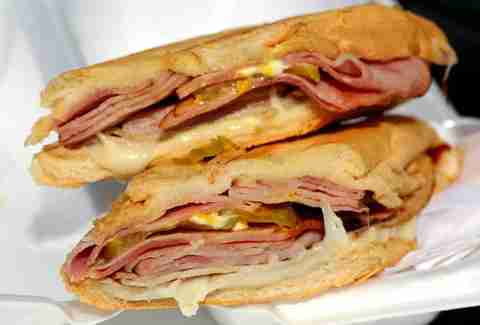 But we also really love Cuban sandwiches. 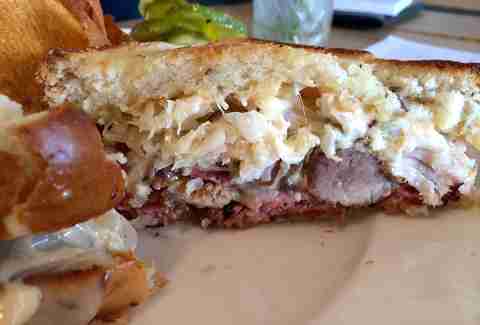 In fact, we love that combination of ham, roasted pork, Swiss & mustard so much, it can be hard to pick the best one. 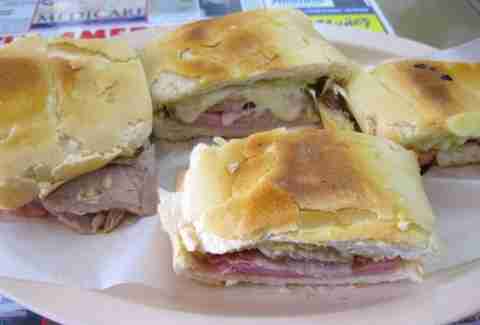 If only some sweet men's lifestyle site would try 'em all and then rank Miami's eight best Cuban sandwiches. OH, WAIT! While this landmark Cuban joint on Red and Flagler is famous for their machete-wielding coconut juice-maker, they wouldn’t be a regular stop for Bobby Flay and other celebri-chefs if the food at their intermittent “food stations” wasn’t just as killer. The Cuban you’ll find in the middle of this steamy Flagami produce market/restaurant is plancha-pressed and no less lardtastic than others, but at least here you can cut it with some fresh-pressed juice. 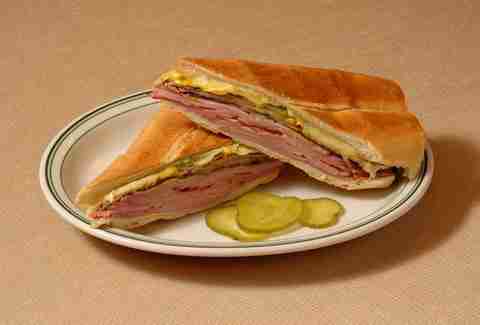 If Marco Rubio and Pitbull have taught us anything, it’s that it's impossible to say what makes a “real” Cuban. So, Chef Alberto Cabrera's applied this forward-thinking approach to sandwiches and gave us the Cuban Rueben: Cuban rye bread piled high w/ roast pork, pastrami, sauerkraut, Swiss & truffle Thousand Island dressing. 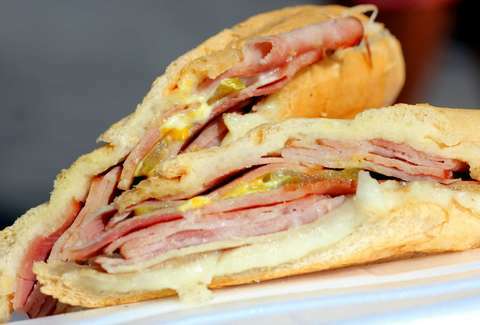 A favorite of the Burger Beast's dad, this sucker's got all the things your standard Cuban sandwich does, except the pork, ham & Swiss are cut twice as thick, the mustard and mayo are all spread on twice as generously, and the toasted Cuban bread is, well, the same size. Man’s gotta watch his carbs, entiende? Fun fact: when the Dolphins’ offensive line imploded midway through last season, they actually briefly considered signing a Sarussi’s Original to a 12-week contract. 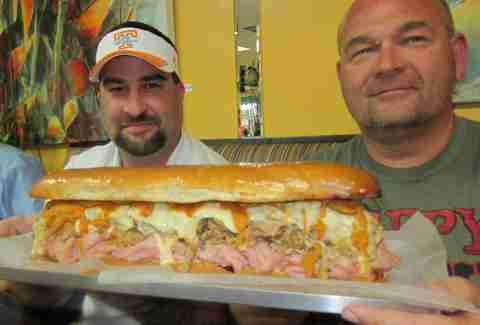 Ok, no they didn’t, but when you consider this 16-inch behemoth on a homemade sub roll that’s loaded with smoked ham, roasted pork, mozzarella, pickles, and secret sauce has slowed down every 300lb dude who’s ever come in contact with it, and already has extensive TV experience on Man v. Food, it doesn’t seem like such a bad idea. 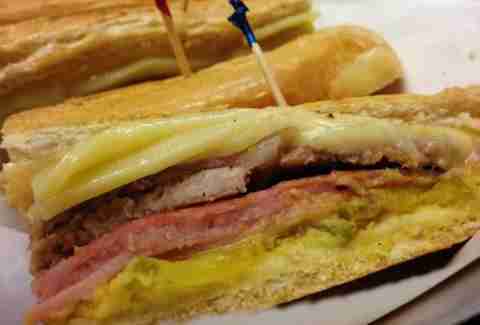 We’re not trying to get all nouveau-trendy-foodier-than-thou with this pick from reigning AAA Four Diamond Award-winner for best Latin food in Miami, but for the love of Pepe Billete, it’s a freaking CUBAN SANDWICH ON A STICK! So, even though your abuelo might roll over in his grave at the thought of ham, roast pork, pickles & mustard formed into perfect crispy cubes, wrapped in fried Swiss, and stuck on skewers, it tastes just as delicious as anything you’ll find in a Hialeah cafeteria. If you want the most quintessential Miami experience that doesn’t involve renting a Ferrari or getting ignored by doormen, it’s gonna be hitting this Little Havana landmark and chomping on pressed Cuban bread -- filled with all the Cuban sandwich regulars -- while sitting outside with a cafecito and listening to all the Cuban restaurant regulars talk about the latest chisme. 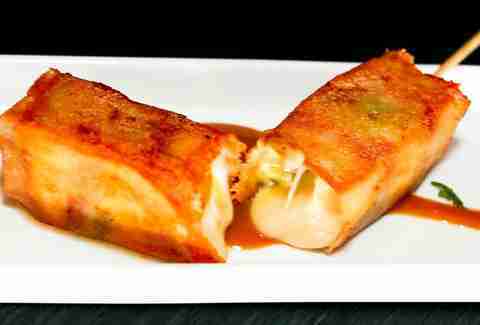 Maybe the most frequently asked question by out-of-towners -- other than “Can you get me into LIV?” -- is: “Where’s the best Cuban food in South Beach?”. And while that answer varies, for a straight-up Cubano there’s no better, easier, or cheaper place than Las Olas, where they coat each piece of Cuban bread with butter before topping it with house-roasted pork loin and Swiss, then put it open-faced in the plancho so everything gets all melty-gooey-delicious, and serve it to you for a very un-South-Beachy $5. A leading sandwich authority whose name may or may not rhyme with “illest” named them one of the top 21 sandwich shops in America. So of COURSE it tops our list of Miami Cubans: not only because they add fresh, fried croquetas to all the usual Cuban ingredients, but also because, despite its location in the no-man’s land between Wynwood and Midtown, it still gets serious love from locals.